Seriously, you really do need to be able to laugh at character death when you play DungeonQuest. If this was a roleplaying game, it would be a dungeon designed by a killer GM. The good news is, unlike a killer GM run RPG, this game is actually a lot of fun. It’s fast, the random design of the dungeon allows for lots of replay value, and makes for a fun dungeon crawl. Winning is partly a matter of luck, and partly a matter of knowing when to stop pushing your luck. 1) It’s a beautifully designed game with good quality components, typical of most of the FFG games that I’ve purchased over the years. 2) It’s fast: unlike a lot of the other board games we play at our game nights (Eldritch Horror, Talisman, Touch of Evil, etc.) this one plays quite quickly. 3) It’s easy to learn. It might take a while to get the hang of every single card, dungeon tile, etc. but the overall game rules are fairly easy to grasp. 1) If you’re looking for an in depth, story-oriented fantasy game, this isn’t the one for you (grab the aforementioned Talisman). This is a dungeon crawl, pure and simple: explore the dungeon, grab loot, overcome traps and monsters, and hopefully get out with your skin before the doors seal themselves. That being said, if you’re in the mood for that style of game, then this isn’t actually a con at all. 2) It’s lethal. It is quite literally possible to step into the first chamber of your dungeon delve and die (not necessarily likely, but possible). There is an optional rule for spawning a new character when this happens, but using the standard rules dead is dead. The fun part of being dead is that you still get to play the monsters and try to kill your fellow adventurers. But if getting killed by a single roll of the dice is the sort of thing that will have you screaming with rage, this game probably isn’t for you. If, like me, you can laugh off the untimely demise of your character and still say you had a fun time, you’ll be fine. All in all, if you’re looking for a fast paced, potentially lethal dungeon crawl game, this one is exactly that. I really have fun with this one, but it won’t be everybody’s cup of tea, so my advice would be make sure all the players at the table know what they’re getting into and are okay with it. Don’t worry about the title, that was a little sarcasm there, plus… I don’t write my own titles (dang, I did it again!). So, I’ve seen a lot of board gamers cry about luck based mechanics in games. I’m not one of those. If I flew my X-Wings off the board that’s not luck, that is stupidity! But rolling 4 dice with four critical hits on my red die and my opponent rolling 3 blank greens and taking that hit card that treats crits as two hits to win the game is… What? Advanced pilot skill? No, it’s luck. There is nothing wrong with a little luck in games. Heck, even asking my son what game he wants to play comes with its own luck factor. Will he pick the game he knows he will beat me at, or will he possibly pick a game I might have a chance in? But I think when luck is used because it was an easy choice to make for a game, and it is the only mechanic IN the game, then it becomes problematic! Candy Land comes to mind. Mind numbing card pulling that does nothing for the advancement of a youngster then teach them how to catch mom cheating because after her third hi-ball she finally slipped up and made it obvious she was fanning cards on her draw to find the candy dude that put her at the top and finally end this misery! Yes, true story. Sorry, Mom. So, this is why I HATE DungeonQuest!! Wait… No, I LOVE DungeonQuest!!! I do! My boys love DungeonQuest too! We set up the board, put out the 90 stacks of cards, staked up all the tiles, set all the chits, argued over who gets which hero and poured my first hi-ball with a toast to my Mother. With luck, I pulled my first tile and then with the luck of the shuffle pulled my first chamber card and it was luckily a trap! Pulled my lucky trap card and it was the swinging blade of death! Could have been ANYTHING else, rolled my lucky dice against my 4 luck and died. The boys howled with laughter! They got to see daddy drink a €7 bottle of Belgian bier in one gulp, pour another and demand a reset of the game. It took us maybe another few quick dies to add one of the alternate rules allowed (I encourage you to use it) in the rule book and modified it to a single death was allowed per game – with discarding all your cards and health etc. We haven’t had any problems since and have actually won 2 of the 5 or 6 games we’ve played. Maybe it has something to do with why we even get into our cars every day… Or fly… Or, heck… Even get out of bed! But this game, if you give yourself over to the life it has planned out for you, is an amazing adventure into a completely uncontrolled slide through a story that you have absolutely have no skill set to rely on. That is what makes this game so fun for us. My middle son (15) sees complex strategies laid out before him clear as day in Forbidden Stars to the point where I just can’t beat him. My youngest (10) is an agility master and kills me in every dexterity game there is (except for beer pong). Those skills do NOTHING for them here! It is a level playing field with excitement and yelling and laughing and not caring and running for another hi-ball mid turn that we just never got with any other game. …so that I can enjoy the moments like these when I have nothing else to worry about than the random nature of life I love so much. Let me start off by saying that this game has a reputation. And that reputation is, in a word, Brutal. No one I have ever spoken to has called this game easy, or even fair. But that just makes me smile. In the gaming world, there have to be games that offer a significant challenge, games that you just can’t breeze through because you know all the tricks. DungeonQuest will kick you in the teeth and laugh in your face if you let it, but you can just as easily laugh in the face of danger in turn, and that’s what makes this game enjoyable; all the absurd ways you can die in this game. To start off, you’re trying to collect as much treasure from this dungeons before the day ends and the dungeon closes. Right away you might ask yourself, “What? Dungeons can open and close like a mall?” Well, this one can. Apparently, this dungeon only stays open for a day, and when it closes, it closes for good, trapping all adventurers inside with a dragon that, apparently, can’t be killed. That in itself is amusing to me, but wait, it gets better. You have a choice of characters you can select, each with their different skill sets and special abilities. There are four attributes to each character, strength, agility, armor, and luck. Often you will have to test one of these four attributes whenever you encounter an obstacle or a trap. Interestingly enough, the strength attribute has ABSOLUTELY NOTHING WHATSOEVER to do with fighting monsters. That’s right…your big, beefy dwarf is just as effective against monsters as your spindly wizard. Why is that, you ask? Because combat is essentially done with cards in what can loosely be defined as a game of War combined with Rock-Paper-Scissors. Let me explain this combat thing in greater detail. You play cards from a combat deck you receive at the beginning of combat, and if you beat your opponent’s card value, it goes on his or her damage stack. If your opponent beats yours, it goes on your damage stack. If you tie, nothing really happens. However, if you play a card that your opponent has the right symbol for (or vice versa), they can play a counterattack card to add its damage value to the total value. If they beat your value with the new value, both the damage card and the counterattack card go to the damage stack. And of course vice versa. This can make combat really short or really long, depending upon random luck and the strength of your draw. By the way, healing? You take your chances with that as well. There is no such thing as a healing potion. Instead, we have the unstable potion, which you sometimes find. It can heal you…IF you make the right roll. A roll of snake eyes on two dice will kill you if you drink it. Anything less than an 8 will hurt you or do nothing, which means that you better roll good if you want to stay alive. And sometimes the game doesn’t give you the luxury…you just have to bite the bullet and hope that the dice gods smile on you. There are other methods to heal, but all of them are just as risky or worse. Here’s my favorite part of this game: You have to journey to the center of the dungeon to try and get at the dragon’s hoard. But as you move and explore, you can encounter rooms that force you to make tests on your attributes. Some are fairly benign, and the game is forgiving with some, allowing you to roll again next turn if you fail, with a determination token added in to increase your odds of making the roll. But some, like the bottomless pit, you better make the roll the first time, because you won’t get a second chance. You fail, you die, end of story. And let me tell you, there’s nothing quite like having to make a luck roll with a character of luck 4 (luck 6 means you have to roll 6 or less on two dice). Those are some hard odds right there. The game can produce some epic stories, though. My favorite so far is one I witnessed; playing with a group of four friends, one of them actually managed to navigate to one room away from the dragon’s chambers. He attempted to open up the door, and triggered a swinging blade trap, which killed his character instantly. This was after he had been delayed for three rounds trying to lift a portcullus just to get to the room. It was the game giving him the proverbial middle finger, and we all had a good laugh about that, because it was just so like DungeonQuest to do something that mean. This game is in the upper echelon of the challenge rating, because not only do you have to get the most gold, you have to get out before the dungeon seals you in. Which means you have to know when to cut your losses. It can be a victory against the game just to get out of the dungeon at all, really. But don’t let the difficulty of this game dissuade you. I for one embrace it, because some games SHOULDN’T be easy to win. When you beat a game that is difficult, it makes you feel like you accomplished something great, and this game is just a lot of fun to play in general. Dungeonquest is a cruel, albeit fun dungeon crawl. You need to have the right frame of mind though. You have to be able to laugh when, after making it to the treasure room, on your way out of the dungeon, you get turned around, fall into a pit, have your torch go out get bitten by a vampire and then ultimately die, beheaded by a vicious trap. Hilarious , no? Most of the things that happen to you are completely random. You roll attribute tests to avoid some pitfalls, while others just happen to you because you draw the wrong card. The only decisions you make are where you want to go, which results in a random encounter and room, and when you want to try and leave this deathtrap of a dungeon. I love it. It has great replay value due to the variety of components and the randomness. No game plays the same, except for you getting mauled. It’s fun to play solo over and over (games take less than an hour) and when you win, you get a real feeling of accomplishment. The combat bogs down a bit in a multiplayer game but goes fast in a solo game, which is how this game shines. Fantasy Flight included baggies to hold all the components (even the board) which are gorgeous. The board is thick, the room tiles are thick and varied in art, the character cards are cool, the minis are fantastic and the card art is great, phenomenal production all around. Plus, the characters come with components allowing them to be used in Descent (1st ed. ), Runebound and Runewars. An exciting, shallow, gorgeous, cruel game. It’s good fun multiplayer and peerless solo. Those who hate randomness or games lacking strategy should avoid it. This game is as ruthless as the PC game Nethack. It does not give. a. single. flying. flip. if you live or die. Killing monsters yields no reward other than the feeling of relief that you did not get murdered (or perhaps the horror that you did not get murdered). Getting to the Dragon’s Lair only means you might end up with some decent treasure to gaze at when you die! The best feeling you get while playing is when you draw an “Empty Room” card. Seriously, this game will kill you. In varied and gruesome ways. My particular favorite is stumbling headlong into a rotating room that butts up against the outside wall. Search twice in hopes of that ever elusive secret door. If you fail, well, you starve to death in a round room. In about 80% of the games that I played, someone died on their very first step into the dungeon. No, I am not kidding. The first step – dead. The combat system is a bit complicated (unnecessarily so in my opinion), so I suggest going over that in detail before starting if someone in the game has not played before. Other than that, this is a game that is very easy to pick up just by playing it. This may sound like a negative review, but nothing could be further from the truth. I LOVE this game! None of the hand holding, coddling and monster milquetoasting that is rampant in other games. Random death from every corner for no reason whatsoever awaits you with sharp nasty teeth. I strongly suggest playing it with people who will revel in how the other players get ripped to bits, eaten alive and charred. I usually don’t like games with too much luck, because I want to feel like I am actually in control, but Dungeonquest is a game I don’t mind being at the mercy of the dice. I had no expectations when I purchased it, as I really only bought it to get the hero figures and stat cards to use with Runewars (which i love. And yes I am quite the dork, I am aware), but I was pleasantly surprised by this game. It is not deep, and can be frustrating if you die on your second turn, but man, is it fun. You randomly flip tiles as you explore and draw cards from various decks which may be treasures helpful items or creatures to fight. It’s quite the random, chaotic game, but still fun, I say again. Basically you try to make it out of the dungeon with the most treasure, ALIVE. That is the key word here. Death lurks around every corner, and sometimes it’s just instant death. Nothing you could’ve done to stop it. I heard someone say this game is like a slasher film, it’s not deep, but it’s a thrilling ride while it lasts. The randomness will be a turnoff for some, but it plays quick, most games last 1/2 hour to 45 min, so I say give it a shot, and don’t be expecting Descent style dungeon crawling, and just enjoy it for what it is. This game with its basic setting of rules makes for a rather hard challenge with a fair bit of complication for something that didn’t need to be so. But with that being said the game states very clearly in the manual that you are entirely welcome to change it and make the game suit your style. One of my largest gripes was a very complicated combat. Player turns go by so quickly in this game that when you hit a combat it would stall the game by as much as 10 mins trying to figure things out. When your turn could take 20 seconds to finish. I decided to redesign the combat using a rock paper scissors using the games own cards. It should make combat more simple and very easy to understand. If you like to think out side of the box for fun. This is totally the game to try it with. DungeonQuest is a nifty game for introducing younger players to the hack-n-slash aspect of role-playing. They’ll learn that there are certain actions they can take that work better or worse for their type of character. They’ll feel the thrill of knocking off some lightweight enemies, and facing bosses. DungeonQuest predates any of the modern cooperative play games, so players won’t get the sense of what it’s like to have a party that works together. This game is the simplest game mechanics of all time. Move, draw a tile, get a card, do what it says. Very little real strategies and everything is up to chance BUT I LOVE IT! The little cardboard tiles are like crack and I can’t get enough. I’m ashamed, but I also addicted my girlfriend on this game and she hates elves and wizards hats and all that BS. So, if you like simple drugs with no thought but a great high, buy Dungeonquest! I have not actually played this yet. I do not have this new version of the game. Here in Malaysia, it is very difficult to find games and then more difficult to buy them. There are few places that sell the games, and those that do sell them for very high prices. I, before the new version came out, downloaded, printed and started constructing dungeon quest to be played as a group game, or to be played as a solo game. The reason that I am not finished with the construction is that I lost motivation. There are almost 400 pieces to put together, and that does not include anything from the expansions. When I finish this, I’m going to enjoy it very much. It is a challenging game, and it has been a challenge to construct. I have now finished construction of this game, at long last. The game is a lot of fun. Very difficult, quite random. I am proud of my PnP copy of the old game. I do not really like the combat, paper rock scissors with cards, so I use the dice rules for single player from the rulebook instead. Setup takes a bit, and the game can be very fast, you usually die after all. I suggest getting this one out when there are more people around to help set it up and to play it for awhile before you put it away. Otherwise it will really seem like a big chore. We bought this game after having the best time playing it at Gen-Con a few years ago. Once we got it home and tried to play it ourselves, we realized it was quite confusing without an expert leading us through the game. I agree Fire-soul that combat is extremely confusing. I wish I could find the desire to try to play it again with some modified combat house rules. 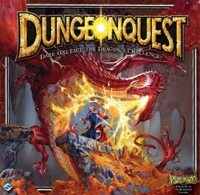 Add a Review for "DungeonQuest"